Their team is called ‘Jo Jo Row your boat’ after a childhood nickname and includes Jo, Rowena and her sister Annika Symonds and friends Sarah Poynter and Wendy Collings. 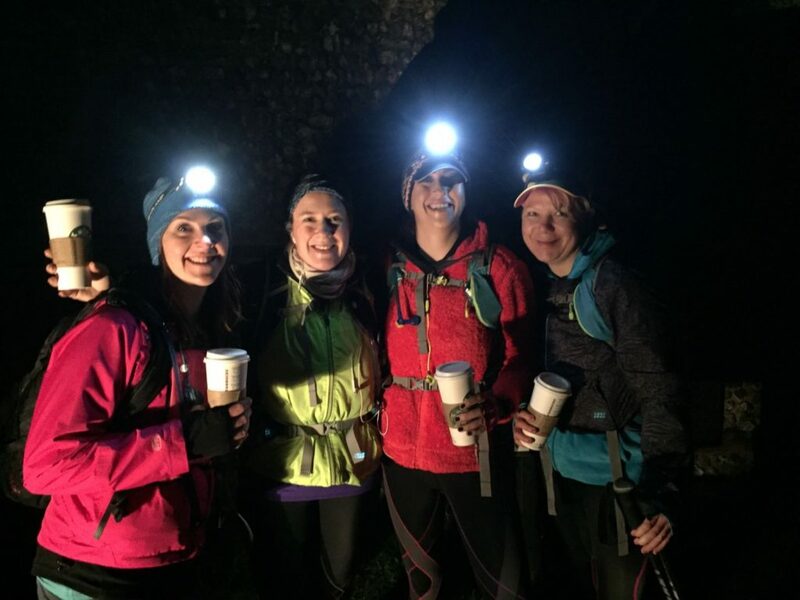 On Saturday 19th March we embarked on our toughest challenge yet: a 26.6 mile night walk from Cambridge Station to Bishop’s Stortford station. The walk was made even tougher by the fact that our team is being plagued by injury! My sister, Annika, has developed a hip stress fracture so is currently hopping around on crutches – thankfully the fracture is healing and her consultant is confident that she will recover in time to train for the walk. Jo Jo has developed tendonitis of her Achilles tendon (following running a half marathon) and therefore was unable to walk. Her physio has reassured her that with 200 repetitions of her exercises daily she will be back on form in a few weeks ready to hit the pavement. Plus Sarah was also unable to walk as she was running a half marathon the next day … so then there were two! Half way point at 3am enjoying a coffee that my lovely husband brought us! Wendy and I had to call in some extra friends – who are taking part in the Isle of Wight Ultra Challenge in 6 weeks – for company. Thank goodness we did as 26.6 miles is a long way in the dark countryside of Cambridgeshire and Essex. We set off from Cambridge Station at 11pm in high visibility vests, with head torches and enough snacks to feed the 5,000. We walked through the night non-stop, apart from when my husband brought us coffee at 13.3 miles (never have I been so pleased to see him, although watching him drive away was torturous!). Dawn was a blessed relief and spurred us on to the finish line. 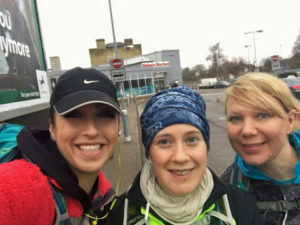 We arrived at Bishop’s Stortford station after 8 hours of solid walking and I cannot describe the feeling of sitting down – it was like my body had never been bent in its life. There were some highs and lows but in the end we made it. A few blisters, aching muscles and major fatigue but mainly the realisation that in the main event we will have walked all day before we face the night stretch – a daunting prospect. We can now say training is in full swing – my weekly step count is about 130,000, my dog is exhausted and frankly so am I!